When I rang the doorbell of a nondescript suburban home in Menlo Park, back in January 1999, I had to laugh: “Google World Headquarters,” said a handwritten sign next to the entrance. 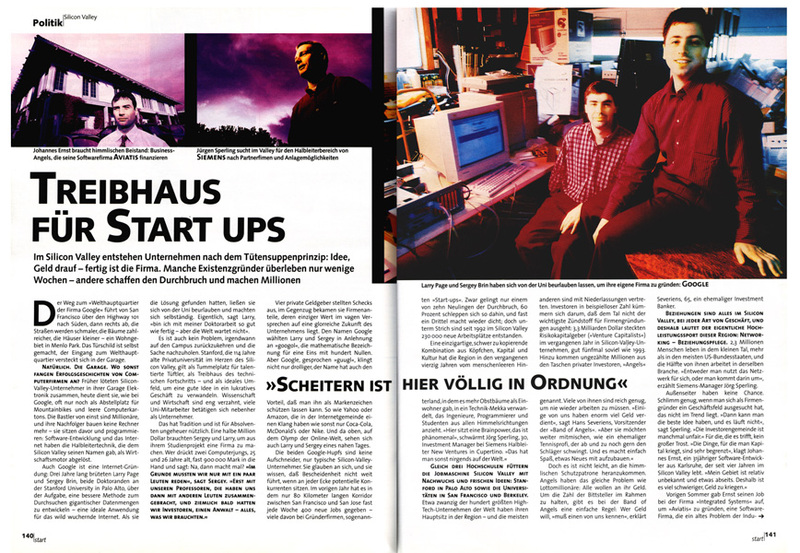 Inside were a handful of programmers, sitting in the kitchen, their PCs towering over the toaster and microwave oven. The garage, Silicon Valley’s perennial symbol of entrepreneurship, was overflowing with mountain bikes, knick-knack, and empty computer boxes. The two Stanford PhD students I came to interview for an article about Silicon Valley’s unique startup culture were a bit late to the game, given that search engines like Excite, AltaVista and Yahoo already dominated the scene. But Larry Page and Sergey Brin were confident that they would be able to catch up and, perhaps, even overtake the front runners. In-between low-level programming, schmoozing their investors, and taking out the garbage, the Google founders took some time for me to talk about providing a service to the world, making money with helpful advertising, and wanting to be on par with Yahoo and Amazon. Below are some edited excerpts from our conversation. 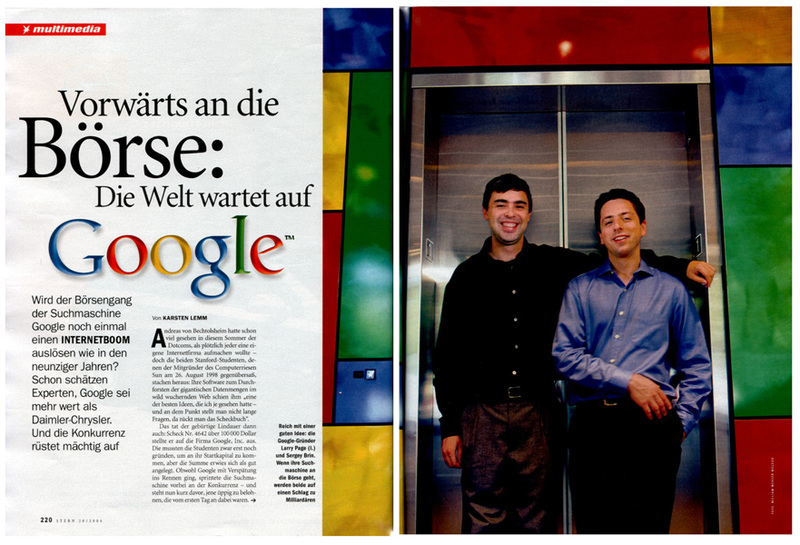 I first looked back at this interview when Google turned 10 in September 2008. Almost five more years have raced by, and Google is now an ever-present digital media giant with more than $50 billion in annual revenue, rather than just a search engine. Yet, strangely, much of what these two Silicon Valley revolutionaries told me back then seems as timely as ever. Well, except for some details – I doubt Larry and Sergey still take out the garbage (even if they may have to take care of the trash in other ways). Larry: Basically I started doing my PhD research on the link structure of the Web, about 3 ½ years ago. And then I got other people interested; Sergey started working on this soon after. Sergey: I was at the time working on data mining. Larry: We’re both PhD students at Stanford, computer science. We’re taking a leave-of-absence. It just seemed like this was a really good opportunity. Craig [Silverstein, Google employee no. 1] and I have very little left to do, but the world doesn’t wait. Was it difficult to find funding? Larry: To be fair: We told these guys what we wanted to do and they asked us good questions and they know enough to know what we’re doing. Sergey: This is based on three years of research. We have a running prototype. Sergey: Everybody who we talked to wanted to invest. No exceptions. Now, we get probably 5 to 10 e-mails every day [from potential investors]. We collect their names. We’ll have to decide [at some point] what we want to do. It’s not necessarily that sensible to have hundreds of smaller investors rather than a few big ones. Aren’t you rather late to the game? Larry: It’s possible to do a much better job on search, and it’s the main application that people use on the Internet. So there’s a big opportunity, because if you do a better job really matters to people. People make decisions based on information they find on the Web. So companies that are in-between people and their information are in a very powerful position. There’s clearly space there for other players. Sergey: Our experience has been that users are very sensitive to the quality of the search responsiveness. When we make minor changes to our system that we think nobody will notice, there’s a very clear response in our traffic. Users may not even realize, but subconsciously they end up using your search engine because it works better for them. Users end up going where the search is best. As we watched our traffic grow time and time again to beyond capacity we’re really not concerned about [being late to the game]. Larry: There’s also lots of big companies that might want to buy a search engine. It’s not an easy technology to develop, and we’ve done a pretty good job. We think we have the best search. Where do you see yourselves in, say, five years from now? Sergey: That’s a long way down the sea. There are a lot of benefits for us, aside from potential financial success. The experience, for example. If we want to start another company at some point, that would be fairly easy because we have all the contacts in the industry. Also, it’s been very exciting. I really enjoyed being a PhD at Stanford, but at Google, we do lots of really different things involved in setting up a company. We take care of very many things you don’t get to see if you’re just purely focused on creating technology. There’s one more important thing, and that’s to bring what we’ve done to the world. That’s very exciting, too, of course. And we think this does have a potential to really change things forever. Larry: That’s one of my personal goals. Search engines play a really important role in people’s lives, determining what information they get to look at. You really want to trust the people that are doing that for you. For both of us, that’s been a strong reason why we started the company, is to say: We think we can do a better job doing this, and that’s an important thing to do for the world. Do you ever consider the risks? Larry: Silicon Valley is a little bit different. There’s not so much risk to us. If you fail in starting your company, you’re actually more fundable. You may have failed for some reason not involving yourself at all, just [due to] some random factors. Sergey: The main risk is really our time. We’re working much, much harder than we would in a normal job. It’s not a 40 hour a week job. We’ve been trying to cut down. When we started we’d be working upwards of 12 hours a day, six days a week. But we have been trying to cut down, because we think this isn’t necessarily most productive. We try hard to take at least one of the weekend days off, and at times both or at least portions of both. Larry: Web companies especially are like 24 hour businesses. You just have to keep things running. When something breaks it needs to be fixed right away. So there are demands, I think, even beyond normal start-ups. Sergey: Anyway, we’re trying to push it down below 60 hours. What’s the main part of your work? Sergey: There are more main parts than we care to have. We try to offload as much as we can to our employees [but] we still do a lot of lower-level programming. Then, we spend a lot of time talking to people in other companies and to VCs, any kind of strategic contact. And we need to do some kind of high-level strategic planning for the company. The other thing we do, by the way, is, taking out the garbage, bringing food for people, making sure we have the phone lines, ordering computers, taking care of the “everything else” category. Starting Monday, we’ll have 6 full-time employees. This week we have 5, last week we had 4. I think it’s going to keep growing at that pace for a while. At some point, the goal is the IPO …? Sergey: There are several possible places where we can take Google. One is to get bought out. After that, we’d still continue to work on it. The other possibility is the IPO. I think it would be much more exciting for us to make Google stand on its own. But both are possibilities. Do your investors talk about a day when they expect to earn their money back? Sergey: Not really. I mean, they talk about schedules to IPO. That’s when they can cash out. But in terms of actually becoming a profitable company and eventually paying dividends or something like that – people don’t bother talking about that, that’s very far down the line. It certainly doesn’t make sense to try to become profitable tomorrow and stay small, rather than keep spending the money and capture ten times as much market share. Larry: Clearly, if you’re providing a service to the whole world, you have to have a fairly big company. Do you generate any revenue at the moment? Sergey: You caught us at an interesting time. Right now, we’re thinking about generating some revenue. We have a number of ways to doing that. One thing is we can put up some advertising. The key there is to put up advertising that will be really useful to our users and not slow down our site. That way we won’t push people away from our site, but we’ll still take in some revenue. Another way would be co-branding. Provide the back-end search engine to other sites. How do you see Google develop? At some point, do you see yourselves on par with AltaVista, Excite, all these other established search engines? Sergey: I would say no. We want to be on par with Yahoo, or Amazon, AOL. AltaVista, Excite and [the others] are by no means viewed as the winners. There’s no question, we want to be number one in market share in terms of search. And I think we can do that in not so long. Past that, it’s really hard to predict. There’s really no reason to set our sights low. If you do things right you can make a big jump over everybody else.